Microsoft released Microsoft Office 365: Connect and Collaborate Virtually Anywhere, Anytime (ISBN 9780735656949), by Katherine Murray, as a free eBook. To download your free PDF eBook, click here or click on the picture. Updates to this eBook, as well as additional eBook formats, will become available in the future, so check this blog for updates. Microsoft Office 365: Connect and Collaborate Virtually Anywhere, Anytime is organized in three parts to help you learn about different aspects of setting up and ­working with Office 365. Part I, “Finding Your Place in the Cloud,” takes a look at the way people are working in the cloud today and introduces you to Office 365. Chapter 1 looks closely at teams, both inside and outside the office environment, and it takes a look at the way Office 365 offers a greener choice for small businesses. Chapter 2 shows you how to create an Office 365 account and set up a profile, and it gives you a big-picture tour of Office 365 so that you can begin planning just what you want to do with the tools. Chapter 3 is for the team manager or person who will be managing the Office 365 site; you’ll learn how to ­customize the site, add mobile devices, and set up and manage Microsoft Exchange, Microsoft SharePoint, and Microsoft Lync online. Part II, “Teamwork in the Cloud,” is your guide to setting up, organizing, ­managing, and helping your team be successful using Office 365. ­Chapter 4 spotlights all the team features you can use to get everybody on the same page, calendar-wise; you’ll also find out how to share files, hold online ­meetings, instant message each other, and broadcast presentations. Chapter 5 walks you through creating, editing, and sharing a team site. Chapter 6 shows you how to create document libraries, share files with team members, and manage the files in SharePoint Online. You’ll also find out about working with file versions, tracking file changes, and comparing and merging files. Chapter 7 shows you how to create and use workflows to keep your team moving in the right direction, and Chapter 8 introduces all things Web App by shining a light on the capabilities of the various tools and showing you how to work with files online, coauthor documents, edit worksheets, broadcast presentations, and share notebooks. Chapter 9 rounds out this part of Office 365 by focusing on mobile technologies: find out how to use the various Office Mobile applications to review, edit, and share the files you develop with your team. Part III, “Connecting in Real Time,” shows you how to use the ­communication and instant-messaging options in Office 365 to stay in touch with your team in real time. In Chapter 10, “Email and Organize with Office 365,” you learn how to use Outlook Web App to import and manage contacts, set email preferences, organize mail ­folders, work with your calendars and tasks, and more. Chapter 11, “Talking it Over with Microsoft Lync,” shows you how to connect in real time to other online users through instant ­messaging, voice calls, and online chats. You’ll learn how to manage transcripts, invite others to the ­conversation, and host web meetings. Chapter 12, “Designing Your ­Public Website,” shows you how to use the web tools in Office 365 to create a ­website to ­showcase your products and services and give your customers a sense of who you are and what you offer. Chapter 13, “Integrating Office 365,” presents a set of examples that show how you and your team can use the ­various tools in Office 365 together to create and share business projects. The Office 365 Deployment Readiness Tool provides analysis of your on-premises environment in preparation for an Office 365 enterprise deployment. The readiness tool is integrated with the guidance provided in the web edition of the Microsoft Office 365 Beta Deployment Guide. Note: Filters were applied to obtain the above object counts for an Office 365 deployment. Directory Synchronization admin requirement met! Active Directory recycle bin is enabled in your forest this may impact your total object count quota for Directory Synchronization. Update values once you have verified your organization does not have any other application dependencies on the UserPrincipalName attribute. Note: All Unicode characters will be converted to underscores (_) in the UserPrincipalName field. You will need to provide each user a UserPrincipalName in order for these users to sign into Office 365. The number of user objects in your forest is supported. 7 10.14.234.234 reports: Destination net unreachable. 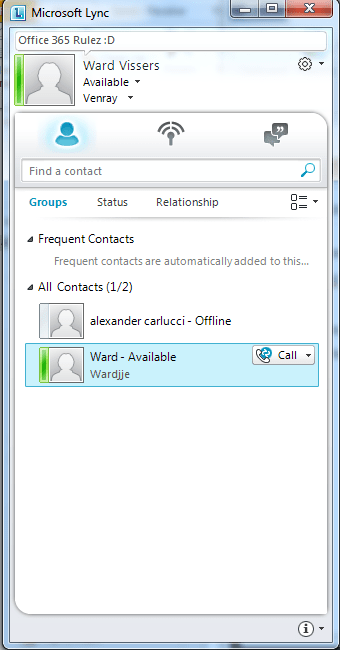 I wonderd if there was a way to add a msn user to my Lync while using Lync Online.